Lama Tsultrim Allione, M.A. in 1970 was the first American women to be ordained as a Tibetan Buddhist nun by the 16th Karmapa. After four years as a nun studying Tibetan, practicing Buddhism and living in the Himalayas, Lama Tsultrim returned her monastic vows, married, and raised a family of three. She earned a M.A. degree in Buddhist Studies/Women's Studies from Antioch University. She is the author of Women of Wisdom, a groundbreaking book on the lives of great Tibetan women practitioners. Her more recent book, Feeding Your Demons: Ancient Wisdom for Resolving Inner Conflict, which became a National Bestseller, makes the ancient principles of the famed Tibetan woman teacher Machig Labdron accessible to the western psyche.Through a five-step practice that transforms our "demons" into "allies" by personifying and nurturing rather than fighting against that which assails us, she has offered a new paradigm with both personal and collective implications. A panel of distinguished Buddhist scholars and practitioners from the Association for the Promotion for the Status of Women in Buddhism, based in Bangkok, Thailand selected Lama Tsultrim Allione as a recipient of the 2009 "Award for Outstanding Women in Buddhism". She was featured in 2013 in a one-hour documentary made by Dutch TV called "Feeding Your Demons: the Life and Work of Lama Tsultrim Allione" and she founded the movement "Wisdom Rising: Re-awaken the Sacred Feminine" with Eve Ensler and others. 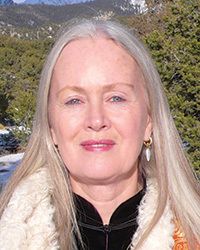 She founded Tara Mandala in 1993, a 700-acre retreat center home to a three-story mandala shaped temple dedicated to the sacred feminine in Buddhism. Lama Tsultrim's skill at teaching arises from the blessings of her many wonderful Tibetan teachers and her experience as a Western woman. View Lama Tsultrim's upcoming programs.